On 2 June 2013, His Holiness Patriarch Kirill of Moscow and All Russia and His Beatitude Archbishop Hieronymos II of Athens and All Greece visited the Russian church of the Holy Trinity in Athens. The Primates were accompanied by members of the Russian official delegation and by Metropolitan Prokopios of Philippi, Neapolis and Thasos and Bishop Gabriel of Diavlia. Greeting the high guests in the overcrowded church was its rector, Rev. Alexander Nosevich. While telling them about history of the church, he underscored that in the nineteenth century the dilapidated church was restored by the head of the Russian ecclesiastical mission in Greece, archimandrite Antonin (Kapustin). He added that the future Patriarch Sergius (Stragorodsky) used to be one of the rectors. Patriarch Kirill recalled that his first visit to Athens took place in 1971, and since then he visited the church of the Holy Trinity many times. He noted that so many people never gathered here. 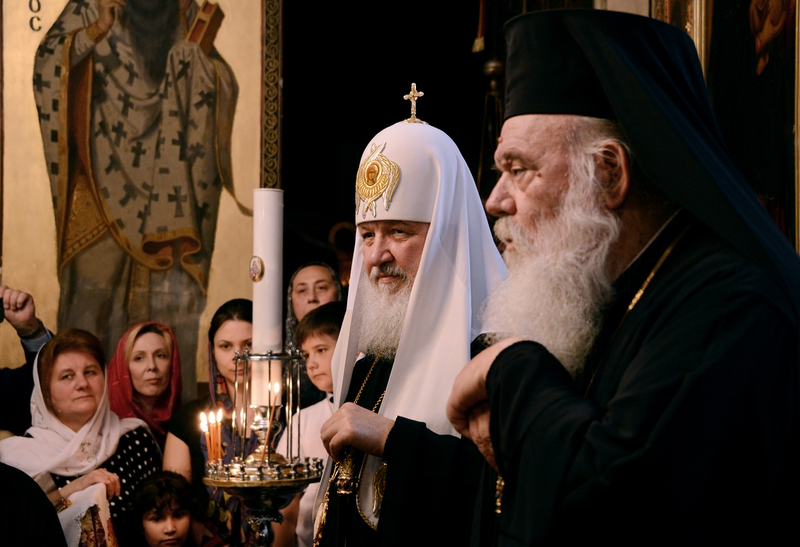 “This shows that even more Russian-speaking people live in Athens and come to this church as to a historical and sacred place,” the Primate of the Russian Orthodox Church said.